WHAT: Shaw Vineyard Estate is celebrating the 2011 Wine Harvest Festival by bringing the HEAD ON Photo Festival to Canberra. A stunning selection of photographic portraits of the highest standards, including the winner of the 2010 Head On Portrait Prize, alongside equally imaginative wines. COOLER autumn nights and the thought of approaching winter bring two things to mind: steaming rich puddings, and good dessert wines – "stickies" – to go with them. And a name we associate immediately with the latter is Robert Fiumara and his wonderfully rich and sweet Lillypilly Estate Noble Blend from Leeton in the NSW Riverina – the 2002 Family Reserve Noble Blend alone already garnering no less than 24 Trophies and 26 Gold Medals at Australian and international wine shows. "Wines like this come along once in a while," says Robert in an almost dismissive aside. "And while this one is still drinking well, stocks are diminishing, so it's near the end of its show life." So enter Lillypilly Estate Noble Blend 2008, that's already grabbing the attention of show judges and consumers alike. Bright gold in the glass, its got fragrant citrus blossom and fresh melon aromas, while intense ripe fruit flavours reflect its 75% Semillon, 15% Muscat and 10% Riesling make-up. Pay $22.50 for a 375ml bottle and enjoy with rich winter puddings or a Crème Brulee. HISTORY in the making: 50th vintage of a legendary great. 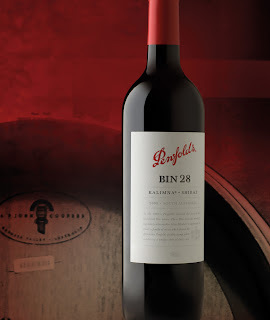 ONE FOR LUNCH: Penfolds have released their 2008 Bin 28 Kalimna Shiraz, the 50th vintage of this legendary great that launched in 1959 as the very first of the company's Bin Range. Originally a single-vineyard wine it's now a blend, in this case warm-weather fruit from the Barossa, Langhorne Creek, McLaren Vale and Padthaway. It's a wine that's intense, almost brooding, with fruit flavour that's dominated by ripe blackberries, liquorice and confectionery – you could almost liken to it to drinking liquid Christmas cake. Pay $33.99 and enjoy with a special occasion Boeuf en Croute, or rare-grilled Black Angus beef fillets off the barbecue. Kicking off on May 5th, six of Australia's hottest winemakers will be taking their wines to the masses in what will be a whirlwind tour of the east coast of Australia, and if you haven't already heard – it's called the New Generation Hunter Valley "Not Your Usual Caravan of Courage"! 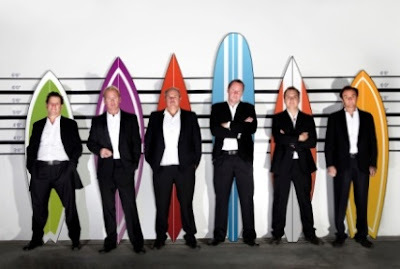 The New Generation Hunter Valley blokes (David Hook, Andrew Thomas, Rhys Eather, Nick Paterson, Mike De Iuliis & Andrew Margan) will be wining and dining their way through Melbourne, Sydney, Newcastle, Port Macquarie, Coffs Habour, Byron Bay, the Gold Coast, Brisbane and finally Noosa where the tour culminates at the Audi Noosa Food and Wine Festival on May 13th – one might say there's no rest for the wicked! But how are they going to get to all these places? Where can you buy tickets for these 'Not Your Usual' events? And what on earth are these guys going to be doing along the way? Thanks to Drive My Car Rentals (www.drivemycarrentals.com.au), the New Generation crew will be travelling in the style and comfort of a fleet of luxury cars. Drive My Car Rentals are an online peer-to-peer car rental company connecting individual car owners with drivers looking for an alternative to traditional vehicle hire at a low cost. You and your friends can be a part of the tour by coming along to any of the 'Not Your Usual Caravan of Courage' wine tastings simply by buying tickets (on sale soon) at the newly launched New Generation website www.newgenerationhuntervalley.com.au . And if you can't manage to make it to any of these events, never fear, as the fabulous team from Spitbucket www.spitbucket.com.au (the online community for all things wine) will be capturing all the excitement and banter on video, and this will be streamed live via the New Generation Facebook page (www.facebook.com/newgenerationhuntervalley), Twitter (@NewGenHV), YouTube, and the 'Not Your Usual Website'… it's all happening, so make sure you're following! The New Generation Hunter Valley are also thrilled to announce some prominent brand partners, such as Riedel (for all your glassware needs), Budgy Smuggler (to keep them decent …just…when they decide to cool off in the Pacific along the way), FIJI Water (to keep the boys refreshed in style), and Roller Studio (a brand and lifestyle creative agency). So, get ready for what will be a tantalizing taste of the Hunter Valley, coming to a town near you! The New Generation Hunter Valley "Not Your Usual Caravan of Courage" is proudly supported by the NSW Government Department of Industry & Investment. Coinciding with the NSW Wine Festival (26th Feb to 31st March) and in celebration of all things New South Welsh-made, Cumulus Estate Wines have released not one but two wines from their estate-grown vineyard that uniquely traverses across the two wine-growing areas of Orange and the Central Ranges, NSW. For Cumulus Winemaker, Debbie Lauritz, the quality of both the 2010 Rolling Sauvignon Blanc Semillon and 2009 Climbing Cabernet Sauvignon really confirms her belief in the diversity of the Cumulus 508-hectare vineyard and the wide range of grapes that can be successfully grown in the pristine, cool-climes of the area. Winemaker Debbie Lauritz says "Both the 2009 Cabernet Sauvignon and 2010 Sauvignon Blanc Semillon clearly express the different areas their grapes comes from within the vineyard. The high-altitude Cabernet Sauvignon fruit is marked by cooler spice notes and a fine palate line whereas the Sauvignon Blanc Semillon from the rolling foothills is juicy, fresh and really lively in the mouth." New South Wales is the second-largest wine growing state with more than a dozen distinct wine regions, but Orange is truly unique in that it is literally defined by altitude and is the highest designated wine region lying at above 600 metres. As Debbie explains "The fruit from the different blocks and different altitudes is handled separately in the winery and we really tailor our winemaking to match. The Sauvignon Blanc Semillon is cool fermented in stainless steel to keep it fresh and clean. The Cabernet Sauvignon undergoes a 35˚C ferment, pumping over twice daily and then spends a year in oak barriques to enhance the elegant, savoury nature of the wine." Further cementing Cumulus's strong commitment to the NSW Wine industry, Cumulus CEO Steve Barbera has also thrown his hat into the ring taking on the role as the Chair of the Export Advisory Committee of the NSW Wine Industry Association. With such a belief in their home-state it's clear to see that Cumulus will continue to lead the charge for the recognition of top-quality NSW wines both at home and abroad. – match it with seafoods. IT's ninety years since the legendary Maurice O'Shea established what is now McWilliams' Mount Pleasant label, and not only was he an innovative winemaker, he had some innovative marketing ideas for the time as well. One of these was to names wines after people he knew well and which he believed reflected the personalities of those family and friends: probably the best knows of these Family Collection labels are Elizabeth Semillon and Philip Shiraz, and now they're joined by a most-interesting 2010 Mount Pleasant Florence Sauvignon Blanc. This is named after Florence Reuben who was the wife of Maurice O'Shea's close friend, the highly-decorated World War I and WWII serviceman, David Reuben. Mount Pleasant Winemaker, Scott McWilliam sourced grapes from no less than seven vineyards across the Adelaide Hills to create this wine. This diversity from the cooler area just above McLaren Vale in the south to the warmer Forreston region in the north, has resulted in a wine that's beautifully refreshing, generous and racy, with loads of passionfruit and lime flavours and a touch of minerality. Pay $17.99 and match it with your favourite seafoods. Ormiston Free Range pork belly. ONE FOR LUNCH: With autumnal and soon warming winter fare starting to come to mind, consider a Sunday lunch of roast Ormiston Free Range pork belly from Mudgee in the NSW Central West, and a good bottle of Peter Logan's Apple Tree Flat 2009 Shiraz from the same region to go with it. Not only is it a great cooler weather combination, you can't look past the quality of this wine – nor the price: at just $11 it's a winner for this Sunday lunch combo, with aromas of a summer pudding full of berries and plums and plenty of fruit and spice on the palate. 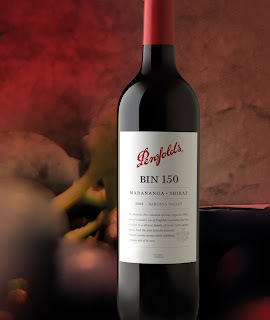 A NEW addition to Penfolds' ever-popular Bins range. PENFOLDS' always-anticipated annual Bin releases are particularly interesting this year, not just because of the strength of these from the contrary 2008 vintage in South Australia, but because of a new addition to the Bins and the 50th release of that old favourite, Bin 28 Kalimna Shiraz. There are a total nine wines in this year's collection, embracing Shiraz, Cabernet Sauvignon, Pinot Noir, Chardonnay, Riesling, and a blend of Grenache, Shiraz and Mourvedre from the 2008 to 2011 vintages. But it's the 2008 wines that deserve attention. These four, the 2008 Bin 389 Cabernet Shiraz, the new Bin 150 Maranangra Shiraz, Bin 407 Cabernet Sauvignon and Bin 28 Kalimna Shiraz, are the product of a vintage in South Australia that began exceptionally, and was then hammered by 15-days of extreme heatwave. Jim Barry Riesling with a crabmeat salad. Much of the fruit came off older and generally earlier-ripening vines that have an uncanny ability to self-regulate themselves to the conditions, and was picked before the heatwave, and the remainder after. Chief Winemaker, Peter Gago says the result is wines that could well be the strongest of the Bins from the first decade of this century. It's an exciting prophesy. ONE FOR LUNCH: Way back in the 1950s, the late Jim Barry and Douglas Lamb both championed the cause of food-friendly varietal table wines at a time when the market was dominated by fortified Sherries and Ports. So it was interesting that the Jim Barry Wines' 2010 Lodge Hill Riesling should take out the Douglas Lamb Perpetual Trophy for Best Dry-style Riesling 2010 and Older at this year's Royal Sydney Wine Show. This wine from one of the Clare Valley's highest and coolest vineyards is all about intensity of flavour: mandarin, white peach and strawberry in particular. At just $19.95 you won't beat it with a crabmeat salad, white fish or pork. Award-winning Kiwi winery Mud House has continued its golden run on the international stage, scoring Wine of the Year for its 2010 Sauvignon Blanc at Finland's Wine of the Year Competition 2011. Now in its 14th year, Finland\'s Wine of the Year Competition judges 470 different wines across 19 categories. Mud House was a standout success at the competition, picking up a Gold - Best Wine in Category - for New World White Wines (over 10 Euro), as well as Wine of the Year. Testament to the quality of Mud House's Sauvignon Blanc, its 2009 vintage also won Gold - Best Wine in Category - for New World White Wines (over 10 Euro) at the 2010 Awards. Success wasn't limited to Mud House white varietals either; with the 2009 Mud House Central Otago Pinot Noir winning Bronze - Third Best Wine in Category - for New World Red Wines (over 10 Euro). Mud House Wines spokesperson Cathy Wansink says recognition for Mud House wines on a global stage is hugely rewarding for the winery. "Finland is proving to be a very successful and profitable market for Mud House Sauvignon Blanc, as well as other varietals," she says. "With both Mud House Swan Pinot Noir and Mud House Pinot Gris recently listed in Finnair Duty Free, we believe the opportunities for our company are endless and are thrilled to be a part of this dynamic market." Arguably rum is one of the most diverse spirits around, with examples coming from all over the globe including the Caribbean, Philippines, Venezuela, Cuba, and Trinidad and Tobago. But it's an Australian owned rum – Holey Dollar Rum – which is taking the world by storm with its unique and distinctive flavours setting it apart from the mass-produced rums that dominate the spirits market. 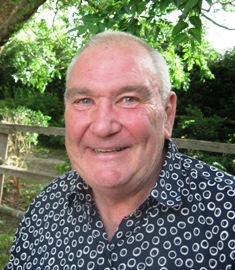 Stuart Gilbert says, "It's wonderful that the International market is recognising the quality of the rums that we are creating but what's even better is seeing how Australian consumers are embracing the 'buy local, think global' concept. The growing group of Holey Dollar Rum drinkers are people that are passionate about discovering something a little bit different and enjoy consuming the highest quality, world-class products, but at the same time, appreciate something that is actually close to home and 100% Australian Family Owned Company. Go on, join the rum rebellion!" Holey Dollar Rum is named after the coins with holes punched out that, significantly, superseded rum as the main form of currency in NSW after the Rum Rebellion. The name was chosen by owned and maker, Master Distiller Stuart Gilbert (2009 IWSC International Distiller of the Year) to reflect the Australian Heritage of the brand and honour the Australian pioneering spirit by hand-crafting a rum at a very high level of quality craftsmanship whilst remaining affordable to all. No longer banished to be mixed with coke or orange juice, these are finely hand-crafted rums with smooth, complex aromas and flavours, and offered in 3 strengths to suit different palates and occasions. Martin Krajewski, Owner and Proprietor of French wine label Chateau de Sours, lands in Australia today as does the much anticipated first vintages from his brand new winery in Bordeaux. The brand is set for a re-launch in Australia with a new and improved image, updated packaging and a new distribution partner, Tyrrell's Wines. Chateau de Sours, situated high on a commanding limestone plateau just to the south-west of Libourne and Pomerol, near St Emilion, recently unveiled its new, state-of-the-art winery. Originally dating back to the 14th Century when it served as an inn on the pilgrimage route to Northern Spain, the property planted its first vines in 1792. Since 2004 under the stewardship of Krajewski, the property has been carefully restored to its former glory. Today Chateau de Sours prides itself on combining traditional rigor and craftsmanship of the old world together with innovative new world flair. Its modern, creative approach enables them to produce some of Bordeaux's most respected red, white and rose wines. Beneath the new winery, with an annual production capacity of 70,000 cases, lies a labyrinth of caves which are used for optimal cellaring of the wines before release. The Chateau de Sours range in Australia includes a Sparkling Rose, a Sauvignon Blanc based Bordeaux Blanc and Merlot based Bordeaux Rouge and its famous still Rose that has been critically acclaimed by Spectator Magazine’s Auberon Waugh as "Probably the best rose in the world". Although the wines are born and bred in Bordeaux, they are modern in style and approachable in price. With most outlets retailing the range with an AUD$28 price-tag, they are extremely affordable and attractive to the everyday consumer, as well as the connoisseur. "My winemaking team do a stupendous job on combining the old world techniques with the new, and have a creative approach to producing wines which are elegant and complex, but at a price point that is accessible to the everyday wine consumer" says Krajewski. Although the brand has been available in Australia for some time, the time has come for more focus to coincide with greater consumer interest in drinking more elegant, savory, lighter alcohol, imported wine. Krajewski has consequently sought out a new distribution partner in Tyrrell's Wines. "Tyrrell's is a leader in the Australian wine industry and have brand prominence globally – they have strong rapport among consumers and the trade and their philosophies are built on maintaining healthy relationships in all levels of business.". Martin is in Australia to promote his re-energised brand and oversee the transition to his new distributor Tyrrell's Wines. BROWN Brothers' acquisition of Tasmania's Tamar Ridge Estates in August of last year was a shrewd move, particularly as it included the very respected Devil's Corner label that's one to look for in value-priced, buy-now and drink-now cool-climate wines. While not one of those regions that spring straight to mind when talking about Australian wines, the first vineyards were established in Tasmania in colonial times, although Tamar Ridge did not come on the scene until 1994. But they've certainly made their presence known since then and their first releases in 1997. One that's just hit the shelves under their Devil's Corner label is a 2010 Pinot Noir that was made from fruit sourced from Tamar Valley and East Coast vineyards. Violet, black cherry and suggestions of ginger spice aromas swirl from the glass, and the palate is up-front with rewarding cherry flavours and savoury hints. And interestingly while it's a full-flavoured wine, this one is soft enough for those who like both their reds and seafoods on the table at the same time, or maybe a creamy risotto; good-value buying at $18.95. ONE FOR LUNCH: Another interesting cool-climate area is the NSW Central Ranges, and a just-released 2010 Rolling Sauvignon Blanc Semillon is a rewarding drop for those who like to try wines originating from vineyards away from our more major regions – and finding just how rewarding they can be. Winemaker Debbie Lauritz chose fruit from the company's own vineyards in the foothills of the Central Ranges and has crafted a wine that's juicy and fresh with tropical fruit flavours and lemon zest acidity. Pay just $17.95 and enjoy with a plate of fresh oysters on the shell. The new NSW Wine Festival programme (formerly NSW Wine Week) is on track to be a huge success with the opening weekend's festivities – Sydney Cellar Door – attracting the biggest attendance ever. The number of wine and food lovers converging on Sydney's Hyde Park South this Saturday 26th and Sunday 27th February was up on last year with an estimated crowd well in excess of 30,000, and many of the 100+ winemakers showcasing their wines reporting sales more than double those in 2010. This was the fourth year that NSW Wine has hosted Sydney Cellar Door but the first year that visitors have had two days (a full weekend) to experience and discover wines for our State's amazingly diverse wine regions. It was also the first time that the talented team behind the Sydney International Food Festival have been involved dramatically increasing the variety and quality of food and entertainment on offer throughout the weekend. James Agnew, Chair of NSW Wine Strategy and Director at Audrey Wilkinson Vineyard, says "Sydney Cellar Door was a massive success and shows that the new format and improvements made to the event this year have been really well received by Sydney. We still have a few figures to collect, but early indications are that most exhibitors saw a good increase in visitors to their stalls, with some experiencing subsequent wine sales of over 300% more than in the previous year! This proves that the city's wine-lovers are not only interested in learning about the diversity of NSW's 14 fabulous wine regions but are also happy to put their money where their tastebuds are." The success of the weekend reflects the recently released Nielsen figures which show that sales of NSW bottled wine in NSW retail outlets are experiencing continued year on year growth, reaching yet another record high of $82.1 million for 2010, up an outstanding 18.3% or $12.7 million from the previous year! Impressively, over half the growth achieved falls within the super-premium $20+ bottle category, confirming NSW wine drinkers' growing appreciation for the quality of their State's product. Throughout March, participating restaurants will offer a special lunch or dinner meal matched with a glass of premium NSW Wine for under $50. Participants include: Azuma, Number One Wine Bar, Catalina Rose Bay, Golden Century, Bathers' Pavilion, Ormeggio, and a number of regional NSW restaurants such as Silo in Newcastle, Eschalot in Berry and Arnott's Bakehouse in the Hunter. To celebrate the NSW Wine Festival, the ever popular Growers' Market, held on the first Saturday of every month at Pyrmont Bay Park, will be transforming the regular Market Chef stage into the Market Wine stage. The stage will for one month only feature not one but two of Australia's most respected wine gurus. Monthly MC Joanna Savill will be joined by Sydney Morning Herald wine authority Huon Hooke as well as the author of the SMH/Age Good Wine Guide, Nick Stock. Even better news – these leading Australian wine commentators will also be joined by many of the State's talented winemakers, including Jeff Byrne from Audrey Wilkinson and Duane Roy from Glandore, who will treat lucky market goers to guided tastings of premium NSW wines. This expert panel will offer commentary and wine tips as well as advice on pairing wines with delicious tidbits provided by key food producers at the market. What goes with goat's cheese (Nugan Estate Durif or Tyrrell's Shiraz? ), smoked fish pate (Scarborough Chardonnay or Logan Rose?) and Indian samosas (Glandore Tempranillo or Cumulus Luna Rosa Rosado?) Find out at the NSW Wine Festival Market! Make sure you are there at 9 am and 10am to purchase your $5 tasting glass and be part of the tasting sessions. Market details: The Sydney Morning Herald Growers' Market is held on the first Saturday of every month at Pyrmont Bay Park on Pirrama Road, from 7 am to 11 am. Every month features around 80 stalls offering everything from fresh fruit and seasonal vegetables to lamb, beef, pork and seafood.